Today those words came back to me as I read the conversation between Solomon’s son, Rehoboam, and the nation. It sounded to me like the people were being more gracious and reasonable than I might have been if I’d been standing in their sandals. David and Solomon had built a great kingdom, but somewhere along the line they forgot a small principle that Jesus was fond of reminding his followers: Anyone who wants to be great among you must be the servant of all. I can see the progression across the generations. David, and to a greater extent his son Solomon, and to an even greater extent his grandson Rehoboam, were willing to advance their own self-centered desires by using their power, authority, and position to subjugate their own people rather than serve their own people. In today’s chapter the inevitable happens. 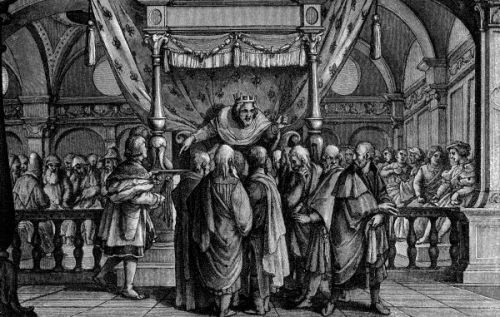 Rehoboam has an opportunity to redeem the situation, but he chooses to follow his father’s example and his peers’ foolishness. The people rebel in a bloody coup. Adoniram, who has been the national slave master since the days of David, is stoned to death. Rehoboam barely escapes with his life. Today, I am thinking about my own positions of leadership, power, and authority as they relate to my family, my work, and my community. I want my own life and leadership to be marked by Jesus’ admonishment to be a servant all, especially those I lead. I don’t want a blind spot of pride, self-centeredness, or foolishness to keep me from doing the right thing for those I serve.